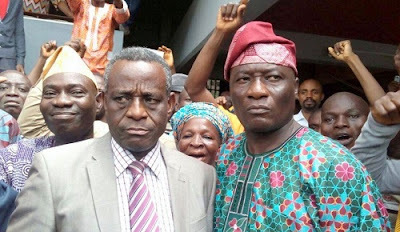 An Osun State high court has remanded a former vice-chancellor of the Obafemi Awolowo University, Ile-Ife, Anthony Elujoba, in custody until Tuesday next week, after the Economic and Financial Crimes Commission arraigned him over an alleged N1.4 billion fraud. The former vice-chancellor and the university’s bursar, Josephine Akeredolu, who both appeared in court in handcuffs, are facing a seven-count charge of diversion of funds and abuse of office. Messrs. Elujobi and Akeredolu have denied any wrongdoing. They appeared before the court presided by Justice David Oladimeji on charges bordering on an intent to steal money belonging to the university and conspiracy to defraud. among other offences. The counsel to the defendants, Ibrahim Lawal, in an application for bail, prayed the court to remand his clients in EFCC custody pending the determination of the application. But the EFCC counsel, Festus Ojo, asked instead that they be remanded at the Ilesha Prisons. Workers of the university, including the current Vice-Chancellor, Ogunbodede Eyitope, were in court to show support to their embattled colleagues.